When we launched BizTucson 10 years ago, our vision was to tell the astounding business stories we have in this community – international companies with deep roots here, scientists researching new medical treatments, inventors turning innovative ideas into new products, entrepreneurs and startups leading us in new directions. 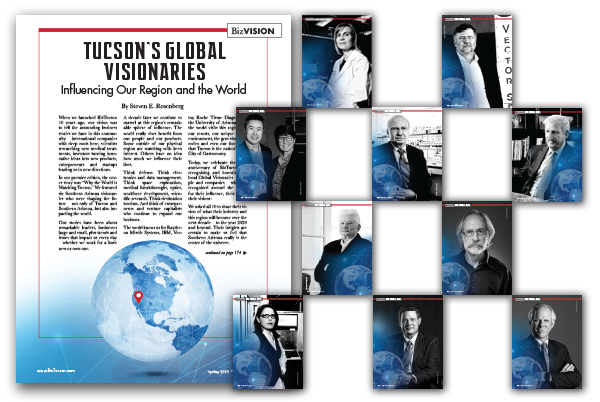 In our premier edition, the cover story was “Why the World is Watching Tucson.” We featured six Southern Arizona visionaries who were shaping the future – not only of Tucson and Southern Arizona, but also impacting the world. Our stories have been about remarkable leaders, businesses large and small, plus trends and issues that impact us every day – whether we work for a business or own one. A decade later we continue to marvel at this region’s remarkable sphere of influence. The world really does benefit from our people and our products. Some outside of our physical region are watching with keen interest. Others have no idea how much we influence their lives. Think defense. Think electronics and data management. Think space exploration, medical breakthroughs, optics, workforce development, scientific research. Think destination tourism. And think of entrepreneurs and venture capitalists who continue to expand our horizons. The world knows us for Raytheon Missile Systems, IBM, Vector, Roche Tissue Diagnostics, the University of Arizona. And the world visits this region for our resorts, our unique desert environment, the gem show, the rodeo and even our food now that Tucson is the nation’s only City of Gastronomy. We asked all 10 to share their vision of what their industry and this region will become over the next decade – to the year 2029 and beyond. Their insights are certain to make us feel that Southern Arizona really is the center of the universe. Steve Rosenberg came to Tucson to attend the University of Arizona and stayed to lain publishing that spans three decades. 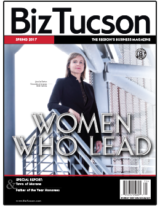 In 2009 he founded BizTucson, the region’s award-wining business magazine. He is active in the community, including serving on the boards of Sun Corridor Inc.,Tucson Metro Chamber, DM-50, Visit Tucson and other organizations. He is the founding chairman of the Father’s Day Council Tucson, which benefits the UA Steele Children’s Research Center.